Not exactly the first thing we'd think of when celebrating a merger, but what the hey. Characters from DQ and FF converge on the board game stage in what will surely become the greatest game ever. Outlandish crossovers definitely have an untapped potential in the gaming world. They’re a cheap thrill, sure, almost always picked on, but a thrill nonetheless. And after a merger as big as the one that led to the formation of Square Enix, home of the two biggest RPG series ever, a Dragon Quest and Final Fantasy team-up seemed only natural. 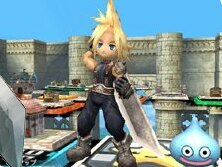 The wild-haired prettyboys of Square’s epics versus the nameless goofs from Enix’s bread and butter?! Any one of us would sign up for that even if it sucked, and don’t deny it. So what better (?) way to combine the worlds of Dragon Quest and Final Fantasy with a game series from the Enix side of the company, Itadaki Street. Itadaki is a loved and long-lived (if infrequent) series of board game titles, a video genre the Japanese market has made standard throughout the years. With that in mind, don’t expect Itadaki Special to be like your typical Mario Party installment, full of sidebar wackiness to try and hold your attention — no, Itadaki Street is all about raising cash and conquering your allotted space in a Monopoly-esque dash to be number one. Though that doesn’t mean IS doesn’t lend itself well to the party atmosphere, quite the contrary, since the series has always had a cartoony outlandish flair to it. The twist for Special, of course, comes in the use of each series’ respective worlds. 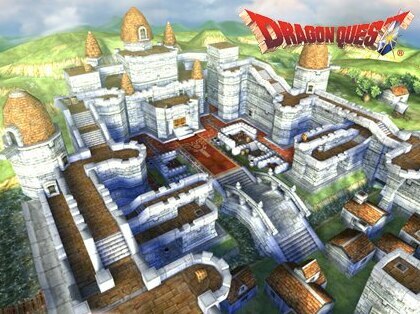 Previous Itadaki games have the playing fields shown high above nondescript cities and other backdrops, but now you’ll be shuffling around the board near locations such as DQ’s Tantegel Castle and FFVII’s Midgar. There’s also the characters, popping up and representing the players on their quests. 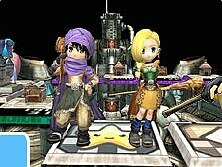 So far we’ve seen Bianca and the hero from DQV, Alena and Cristo from DQIV and even the YRP girls from FFX-2. 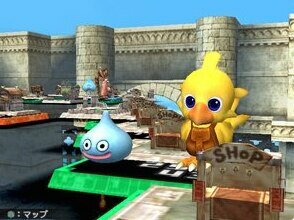 Not to mention the appearance of the series’ mascots, the slime and chocobo, who also provide their adorable faces. From screenshots we’ve gleaned that the hero characters can team up as well, though probably just to “attack” or something just as frivolous. Itadaki Street almost made it to America before any of this crossover business. Enix America had long planned to release Road to Riches, an English version of Itadaki Street 3, but with the company losing footing and facing an upcoming merger with Square, the game never made it.